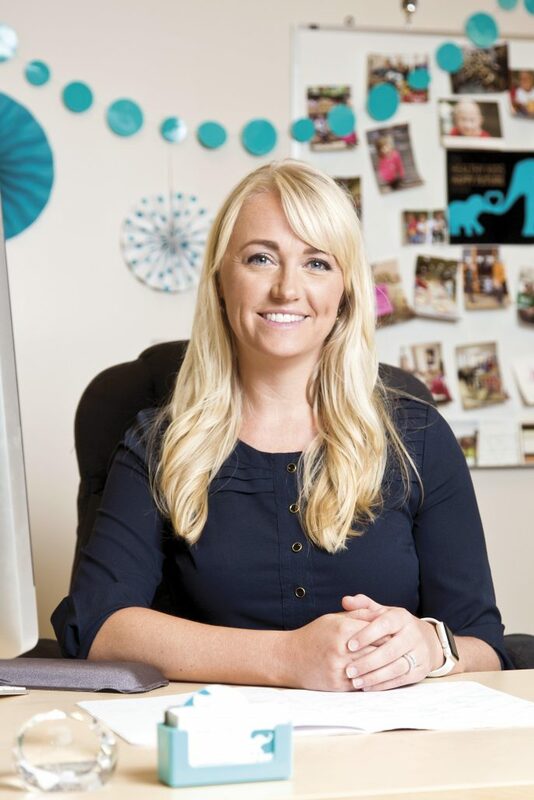 Kimmi Wernli, the second-generation owner of Crazy Richard’s Peanut Butter Company in Plain City, embraces this message as she takes her family company in bold new directions while balancing her roles as CEO, wife, and mother of four. Since Wernli took over for her father in 2016, she’s consolidated two companies under the Crazy Richard’s brand and created a formal commitment to health education. “We’re crazy redefined — crazy enough to believe that one person can make a difference,” Wernli says. Q. What was your experience with the company prior to taking over for your father? A. I was a child when my dad acquired Krema Peanut Butter Company and shortly thereafter purchased Crazy Richard’s Peanut Butter Co. We did own the facility in Grandview, and that’s where I got a lot of exposure as a child to business and to peanuts and peanut-butter manufacturing. I worked for my family all through grade school and into college, helping in different aspects of the business. Then I moved away, went to college and got married. Q. Why did you want to take on leadership of the company? A. In the back of my mind, I think I always knew that was something my husband and I would come back and do. Around 2011-12, my husband and I were living in Florida, and my father called and said, “I’m thinking I probably want to look into selling this business.” That’s when I decided we needed to make a change. We moved our family up here to Ohio and my husband started working for the company full time, and I had twins who were really small, so I was just helping part-time until they got into school. When they started school half-day, that’s really when I realized I wanted to be completely immersed in every aspect. It was just a part of who I was, and it was something I had grown up with and a product I believed in and loved so much. I realized this was the perfect timing for me to help my dad transition out of the company. Then he accepted a position serving a church mission in Seoul, South Korea. So he left the country and left me in charge, and that really gave me the creative freedom to explore and expand my wings and to change a lot of things that needed to be changed to bring the company into the 21st century. Title: Owner and CEO, Crazy Richard’s Peanut Butter Co.
About: Crazy Richard’s Peanut Butter Company sells peanut- and nut-butter products made with no added salt, sugars or additives. Q. Why did you decide to consolidate the Krema and Crazy Richard’s brands? A. This was something my dad has battled with since he’s had both companies. As he expanded, all of a sudden, he had more difficulty keeping track of orders and whether trucks were delivering Crazy Richard’s or Krema because it was the exact same product. Logistically, it can be a nightmare, and from a financial standpoint, we’re housing two sets of inventory for the same product. So the idea was if we consolidate, we increase our efficiency and our savings. It was also a huge hurdle for us from a marketing standpoint. It just made sense in a lot of different ways to consolidate into one brand. Q. Why did you choose to eliminate Krema and keep the Crazy Richard’s name? Q. What has been the result of this consolidation? A. We took some initial hits. We had to pull some Krema inventory, and we donated it so we could switch over to Crazy Richard’s. Since then, our sales have increased month over month. Our story is also a lot easier to get across now. Q. What opportunities and challenges do you see in the peanut-butter market? A. The nut-butter category has become very crowded. Five years ago, if you walked down the nut-butter aisle, you would see a lot of jams, jellies, honeys and spreads and a smaller amount of nut butters, but now it is very swamped. Sugar is the black sheep now of the food industry, where it used to be fat. The challenge for us is staying relevant in this completely saturated market. We’re working on a new product right now. It’s really exciting and will move us out of the peanut butter category. This will help keep us relevant, and instead of just trying to compete in this over-saturated part of the grocery store, we’re going to do something totally different, and I think that’s going to be really exciting.